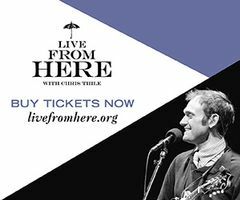 Michigan Radio welcomes Live From Here with host Chris Thile to Detroit for a special live broadcast performance. The show will take place at the historic Detroit Opera House, and marks the show’s first visit to Michigan. Mandolinist Chris Thile is among the most highly acclaimed musicians of his generation. The Grammy winner started the band Nickel Creek and currently leads the acoustic quintet Punch Brothers. Each week on Live From Here, Thile welcomes a wide range of well-known and up-and-coming talent to share the stage and create a beautiful listening experience. In addition to regular tickets, a limited number of VIP tickets are available that include premium box seats and a private post-show reception with Chris Thile and the show's performers. Those VIP tickets are available here.